C-470 west at U.S. 85 (Santa Fe Drive). Photo taken 08/11/16. Colorado 470 is a state maintained freeway encircling the southwestern quadrant of the Denver metropolitan area. Referred to almost exclusively as C-470, contrary to E-470, the tolled beltway around Aurora and northeast Denver, the freeway serves commuter traffic around Centennial, Littleton, Ken Caryl Ranch, Lakewood and Morrison. The north-south leg of the loop is a scenic freeway, paralleling the Hog Back north from Chatfield State Park to Green Mountain. A northern extension joins C-470 with U.S. 6 at Golden as well. Curving north between Mount Glennon and Soda Lakes ahead of Morrison on C-470 north. Red Rocks Park appears on the distant Mount Morrison. Photo taken 08/11/14. 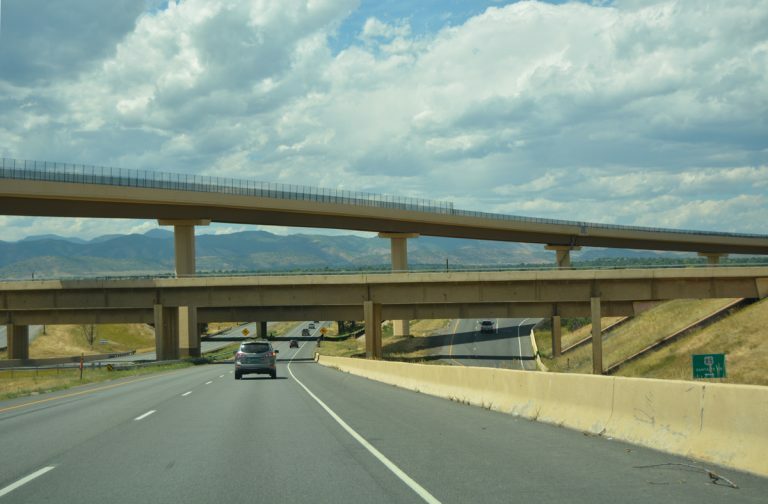 "C-470: Long-awaited road seems a success." Denver Post, The (CO), November 13, 1989. "C-470 will be christened today - Races, speeches, flyover scheduled." Denver Post, The (CO), October 27, 1990. "Lamm on C-470: He's right but wrong - Final segment of freeway opens." Denver Post, The (CO), October 28, 1990. "New Highlands Ranch, C-470 exit open Link to help relieve crowded intersections." Denver Post, The (CO), June 11, 1998. "Road crews ready to make flyover history." Denver Post, The (CO), October 1, 1997. "C-470 spur opens Golden opportunity." Denver Post, The (CO), August 31, 2000. 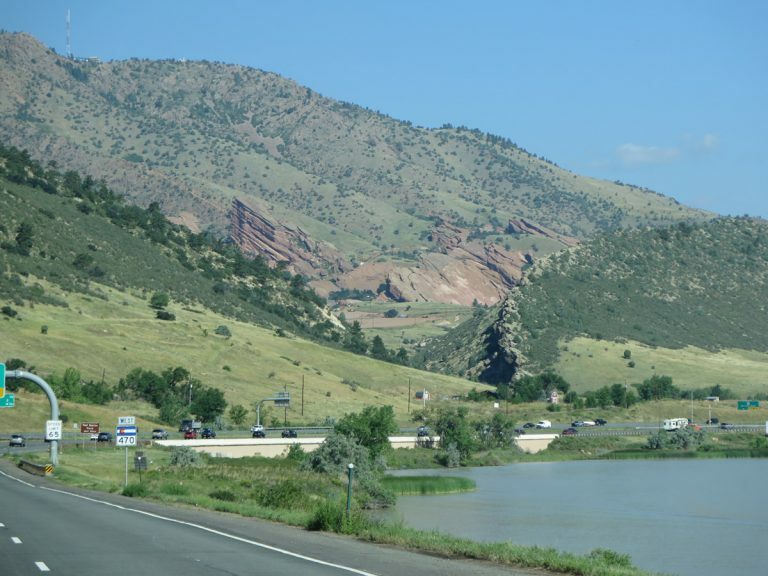 "C-470 gap under study - WestConnect Corridor Coalition discusses coordinating road projects." Denver Post, The (CO), April 4, 2015.